A brand new, hot off the presses news release with tour dates! (Los Angeles, CA) April 18, 2008 – GRAMMY® award-winning band Third Day and multi-Platinum rockers Switchfoot will team up with the acclaimed Robert Randolph & the Family Band and GRAMMY award winners Jars of Clay for the “Music Builds” tour, which will kick off on August 21st in Detroit, MI and conclude in Denver, CO on October 12th. Exclusive content and promotions for the tour will be available via MySpace’s Impact Channel (http://impact.myspace.com), the site’s platform for social and civic engagement. The internet pre-sale begins May 14th and tickets go on sale to the general public May 16th. Tickets are available at www.LiveNation.com. Habitat for Humanity affiliates located in tour cities will be the beneficiaries of a portion of the funds raised during the tour, through a multi-platform program run by Hollywood for Habitat for Humanity and Live Nation, in conjunction with the artists. 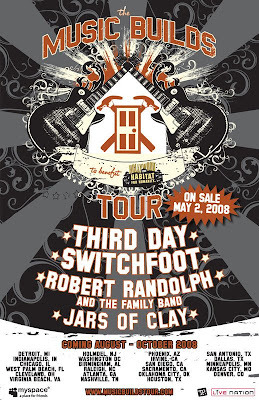 To kick off the tour, Third Day, Switchfoot and Robert Randolph & The Family Band will perform at a special kick-off party on April 21st at The Wildhorse Saloon in Nashville, TN. For information on this show, visit http://www.wildhorsesaloon.com. All four headliners will preview material from their upcoming studio albums on the “Music Builds” tour, which will hit amphitheatres and select arenas in 23 major U.S. markets. (See below for a full itinerary.) Additional performers will soon be announced for the side stage, which will feature many of today’s most promising up-and-coming artists. “We couldn’t be more excited for this opportunity to play on the same bill with bands we respect, and to help an organization whose work we respect,” says Third Day bassist Tai Anderson. “The only message we have for our fans is this: Get ready.” Adds Jon Foreman, lead vocalist for Switchfoot: “We have all worked with Habitat for Humanity before, and when approached about touring together, to benefit such a great cause, it was easy to say yes. We all want to be a part of something that makes a difference. Through Habitat this tour will help build houses for many deserving families - that's something we can all rally around." The tour will benefit Habitat for Humanity’s home building in many ways. For starters, artists on the tour will collectively donate $1 to Habitat for Humanity for each ticket sold during the tour. In addition, funds raised from ticket auctions, special merchandise items and event packages will be designated to fund Habitat for Humanity in each tour city. The bands plan to pick up hammers and lend a hand at various Habitat for Humanity build sites along the tour and to invite some current and future homeowners to attend the show as their guests. Over the past decade, Atlanta-based Third Day has racked up 24 No.1 radio singles and sold more than six million albums, with RIAA certifications including one Platinum record, one Platinum DVD, and six Gold records. The band has garnered 23 career Dove Awards, three GRAMMY Awards (from eight previous nominations), two consecutive American Music Award nods, multiple ASCAP honors, and has developed a historic partnership with Chevrolet. Third Day – comprised of Mac Powell (lead vocals), Mark Lee (guitar), Tai Anderson (bass) and David Carr (drums)– has maintained a touring record second-to-none by playing for audiences reaching into the millions. In addition to these many accolades, the band is most proud of its humanitarian efforts that include raising nearly $300,000 for the victims of hurricanes Katrina and Rita and charities such as the Blood:Water Mission. The band is responsible for encouraging over 15,000 fans to sponsor children across the globe through the work of World Vision. Revelation, Third Day’s eleventh studio album, was produced by Howard Benson (All American Rejects, Flyleaf, Daughtry) and is already receiving acclaim at radio for its first single, “Call My Name.” In addition, it’s garnering very positive early feedback from media. The single released digitally through Amazonmp3.com the same day it was released to radio (April 4) and rocketed to the No. 1 spot that day. The album drops July 29. For more information on Third Day, please visit: www.ThirdDay.com. With over five million records sold, three albums in the Billboard Top 20, two top-five singles at both pop and alternative radio, Switchfoot is recognized as one of the hardest touring bands in rock. The San Diego-based band has sold nearly three million concert tickets worldwide since the 2003 release of its double-Platinum breakthrough album The Beautiful Letdown. Oh! Gravity, Switchfoot’s latest studio album, debuted at No. 1 on the iTunes Top Albums chart and received stellar reviews, with Billboard magazine calling it “the best of the San Diego group’s nearly 10-year recording career.” Spin exclaimed this album is “their liveliest record, full of dive-bombing guitar fuzz, juicy arena-alt choruses.” “This is an outstanding record in every sense,” raved Associated Press. MTV’s “Life of Ryan” tapped the album’s title track for its theme song as the album showcases a harder rock direction for Switchfoot. “This Is Home,” a song written by the band for Prince Caspian, the new Narnia movie, will be featured in the end credits of the film and is the lead single and video for the accompanying soundtrack. It impacts radio on April 25th. Switchfoot’s next album is due out this fall. With an ever-growing fan base, Switchfoot has also been actively involved in a number of humanitarian causes since its inception, including DATA, Bono’s THE ONE Campaign, Invisible Children, Habitat for Humanity and To Write Love on Her Arms. The band further founded the Switchfoot Bro-Am, a surfing and music benefit-event, and the online magazine, lowercase people (www.lowercasepeople.com), a daring new endeavor to revolutionize the way beauty, truth and humanity are viewed. Switchfoot is: Jon Foreman (vocals, guitar); Tim Foreman (bass, backing vocals); Chad Butler (drums); Jerome Fontamillas (guitar, keys, backing vocals); and Andrew Shirley (guitar). For more information on Switchfoot, go to www.switchfoot.com. Since emerging from a House of God church in Orange, New Jersey, Robert Randolph has been named one of the 100 greatest guitar players of all time by Rolling Stone. Following the path of other gospel-rooted pop stars like the amazing Aretha Franklin, he always intended to return to his own gospel roots at different points throughout his career. For 2008, the Grammy-nominated Randolph has teamed with acclaimed producer T-Bone Burnett to record a new album that is part rock and part sacred steel, the Gospel music heritage that serves as the foundation to Randolph's music. Besides key cover songs and the re-envisioning of old gospel classics, Randolph has also invited two of his Sacred Steel mentors, Calvin Cooke and Aubrey Ghent, to participate in this classic recording combining unprecedented guitar explorations, roots music traditions, and gospel spirituality. Robert Randolph & the Family Band (comprised of Randolph on guitars and vocals, Danyel Morgan on bass, Marcus Randolph on drums and Jason Crosby on Hammond organ and piano) will be on the road with Eric Clapton this summer (Bonnaroo and other festivals). For more information on Robert Randolph & the Family Band, go to http://www.robertrandolph.net. Multi-Platinum and GRAMMY Award winning band Jars of Clay (Dan Haseltine, Charlie Lowell, Stephen Mason, and Matt Odmark) launched its career with the hit song, “Flood” in 1995. Since then, it’s amassed more than five million in career sales (5 Gold, 2 platinum and 1 double platinum certifications), three GRAMMY Awards, an American Music Award nod, 17 No.1 radio hits, and numerous film credits and BMI honors for songwriting and performing. Hollywood for Habitat for Humanity (HFHFH) is an entertainment industry partnership with Habitat for Humanity. HFHFH supports Habitat for Humanity’s goal of ending poverty housing worldwide and making poverty housing a matter of conscience and action. Participants support the mission through donations, volunteer hours and advocacy. HFHFH’s partner affiliate, Habitat for Humanity of Greater Los Angeles, helps connect entertainment industry volunteers to opportunities locally and around the globe. Actors, screenwriters, agents, directors, producers, musicians and label executives are among the thousands of volunteers who have helped build homes for people in need, in the United States and around the world through their efforts. For more information, visit www.hollywoodforhabitat.com. Live Nation is the future of the music business. With the most live concerts, music venues and festivals in the world and the most comprehensive concert search engine on the web, Live Nation is revolutionizing the music industry: onstage and online. Headquartered in Los Angeles, California, Live Nation is listed on the New York Stock Exchange, trading under the symbol "LYV." Additional information about the company can be found at www.livenation.com under the “About Us” section. MySpace, a unit of Fox Interactive Media Inc., is the premier lifestyle portal for connecting with friends, discovering popular culture, and making a positive impact on the world. MySpace has created a connected global community by integrating web profiles, blogs, instant messaging, e-mail, music streaming, music videos, photo galleries, classified listings, events, groups, college communities, and member forums. MySpace's international network includes more than 20 localized community sites in the United States, Brazil, Canada, Latin America, Mexico, Austria, Denmark, Finland, France, Germany, Ireland, Italy, Netherlands, Norway, Portugal, Spain, Sweden, Switzerland, Australia, India, Japan, and New Zealand. Fox Interactive Media is a division of News Corp. (NYSE:NWS - News, NWS.A - News; ASX:NWS - News, NWSLV - News). For more information, visit http://www.myspace.com.